Home > Used Vehicles > 2016 GMC Yukon XL SLT,LEATHER,SUNROOF,8 PASSENGER,BLUETOOTH, BACK UP CAMERA,LOTS MORE!!! 2016 GMC Yukon XL SLT,LEATHER,SUNROOF,8 PASSENGER,BLUETOOTH, BACK UP CAMERA,LOTS MORE!!! Cylinders: 5.3L V8 16V GDI OHV - 8 cyl. Hurry on this one! Marked down from $57900 - you save $5301. 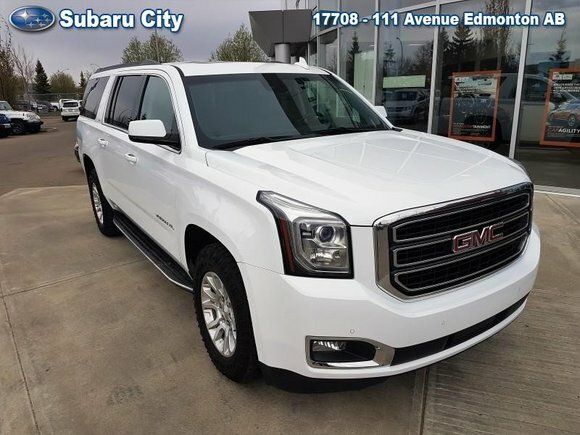 This 2016 GMC Yukon XL is for sale today in Edmonton. The 2016 Yukon XL is a bold and luxurious, full-sized SUV. This amazing vehicle provides room for up to nine passengers with superior towing abilities and better, more distinctive styling. Sporting an all-new look, the 2016 GMC Yukon XL delivers a slew of new technology for better efficiency, performance, comfort and utility. The unparalleled driving experience of the Yukon XL stems from its strikingly quiet cabin. In fact, there is no quieter SUV in its class!This SUV has 39240 kms. It's summit white in colour and is completely accident free based on the CarProof Report. It has an automatic transmission and is powered by a 5.3L V8 16V GDI OHV engine. It has some remaining factory warranty for added peace of mind. Buy this vehicle now for the lowest bi-weekly payment of $339.69 with $5606 down for 84 months @ 5.99% APR O.A.C. ( taxes included, $790 Administration and Secure Ride included / Total cost of borrowing $11372 ). See dealer for details. Want to try the 2016 GMC Yukon XL SLT?